With your Chromebook, it is possible through USB or Bluetooth to work more easily with a mouse or keyboard. Sometimes when duty calls, you have to post up and work on your computer for hours on end. Spending hours upon hours using a smaller keyboard and touchpad may make your mobile-computing experience a bit of a grind. To make things easier, it’s sometimes nice to have a separate keyboard or mouse that can be plugged in and used with your laptop. To connect a USB keyboard or mouse to your Chromebook, you just need to locate the USB port on the side of your computer and insert the USB connector for your device in the port. Your USB connector can only go in one way, so don’t force it. Your Chromebook automatically detects the new keyboard and applies all existing keyboard settings to it. Click the status area in the bottom-right of the desktop. If your Bluetooth is disabled, click to enable it. Chromebook begins searching for available Bluetooth devices. Ensure your Bluetooth keyboard/mouse is enabled and wait for it to appear in in the Bluetooth list. Select your keyboard/mouse from the list and follow any instructions that appear. When connecting a keyboard, enter the randomized pin on the keyboard to ensure it’s the correct device. Upon successfully pairing your keyboard with your Chromebook, your Bluetooth keyboard assumes all existing keyboard settings, and you can start typing immediately. Open the settings panel and choose Settings. Scroll down to the Device section and select Touchpad Settings. The Touchpad dialog box appears. 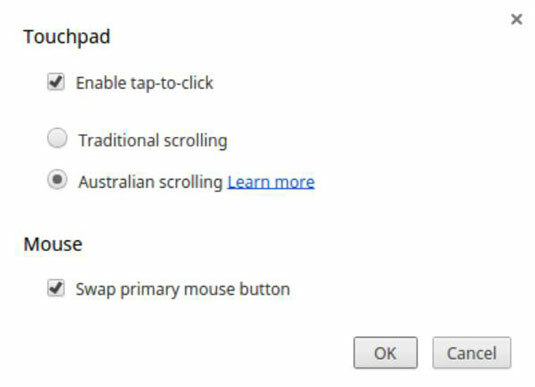 Select the Swap Primary Mouse check box, then click OK.